Fouberg/Nash/Murphy/de Blij, Human Geography: People, Place, and Culture Second Canadian edition is an engaging presentation of the dynamic and complex relationship between peoples and the worlds they inhabit. Each chapter is organized around five key themes and begins with a set of core questions that will keep students focused on the foundational concepts of this exciting field. 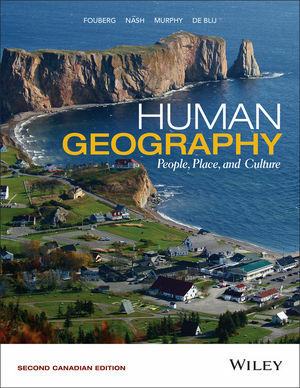 Set within a global context and written with today’s students in mind, we have included several unique topics that make this text the most up to date and relevant offering currently available for Canadian Human Geography classrooms. The text draws from the five major themes of location, region, place, landscape, and movement. Each chapter contains a Guest Field Note by a Canadian scholar. The authors discuss why they are interested in a particular area of research and discuss the research itself. Substantial glossary of key terms by chapter are provided, including definitions in the margin for quick and easy reference. Main Points are summarized at the end of each section for review. Up-to-date Canadian examples are geared to engage a first-year audience.